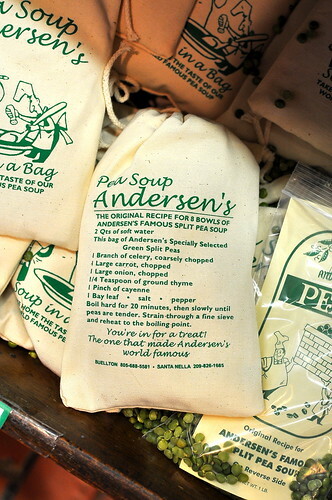 The Astronomer and I had no intention of dining at Pea Soup Andersen’s during our stay in the Central Coast. However, the spectacle of a restaurant seemed to beckon us in from the moment we arrived with its cheesy cartoons and garish color scheme. Not to mention that our hotel was located directly next door, which meant that there was really no escaping the allure of a big bowl of pea soup. On our final morning in town, we finally gave in to Pea Soup Andersen’s undeniable mystique and grabbed a table for two. The restaurant, which Anton and Juliette Andersen opened in 1924, is something of an institution in these here parts. The clientele is comprised mostly of tourists looking for a diversion while traveling from Southern California to points further north, and vice versa. The Pea Soup Andersen empire includes the signature restaurant, a Danish bakery, a gift shop, and an inn where we stayed. The dining room has held up well considering how long this place as been around. The vibe is a cross between a down-home diner and a medieval castle. Service is efficient, but mostly indifferent. 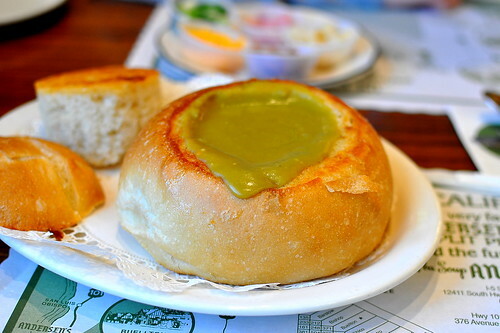 With plans for a Danish brunch in Solvang later in the morning, The Astronomer and I shared the “Split Pea Soup in a Bread Bowl” ($8.50). Juliette Andersen, one of the restaurant’s original owners, brought the pea soup recipe with her when she immigrated to Buellton from eastern France. 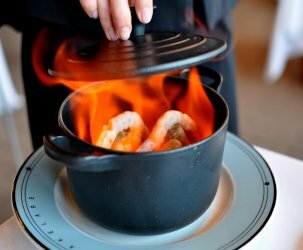 It’s been the restaurant’s number one seller from the start. A ladle-full of green soup filled the sourdough bread bowl to the brim. I appreciated that the bread’s toasty innards were served on the side for extra carbage. The soup tasted more or less how I expected—the flavors were mild and one-note, while the texture was a little gritty and slightly thick. 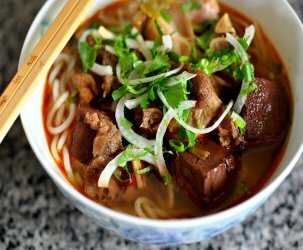 I could see how a warm bowlful might be comforting for travelers far from home. The soup was served along with a plate of diverse fixins. I dumped the cups of bacon, cheese, and scallions into the bread bowl, while the stale croutons and cold diced ham were left untouched. The various ingredients made the soup a little more interesting to eat. 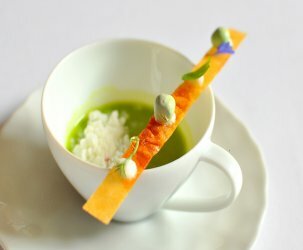 Has this write up put you in the mood for split pea soup? 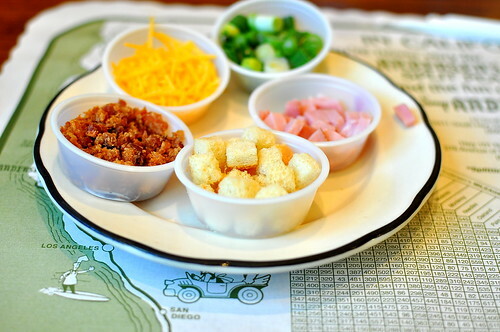 Here’s the restaurant’s not-so-secret recipe. You’re welcome! I actually really like split pea soup! There’s a great recipe in the Bon Appetit Fast Fresh and Easy cookbook that calls for dill, green peas and leeks. Helps jazz that humble split pea up a bit! 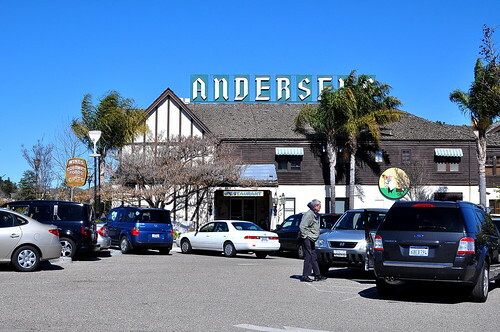 Being from northern CA, Andersen’s has been the bathroom and lunch spot on our way to Disneyland and the such. I’ve always loved the gift shop the most but their bowl of vegetarian green goop is a tradition that I passed down to my own children. When your 5, this place is magical and as an adult the bathrooms are squeeky clean. TripleScoop – You are missing out on really clean bathrooms according to commenter Tai 😉 Food-wise, you’re better off continuing up the 101. Although, the little ones might enjoy the gift shop! It’s a fun stop if you’re dying for a break. Cliff – You can build yourself a pea soup empire! Make sure to open your place in the middle of nowhere. It’s an important part of the business plan. I’ve eaten here maybe 50 times since the mid 50s. It’s a tradition passed down from my dad, a cross country trucker. Nice to see it get a shout-out. I was last there in September. Always been curious about it. Your expectations (and what you received) were exactly what my expectations were. I’m still curious about the name of the restaurant… I’ve seen the canned version of their soup at the market, but I was scarred by watching the exorcist at an early age and just can’t appreciate split pea soup. 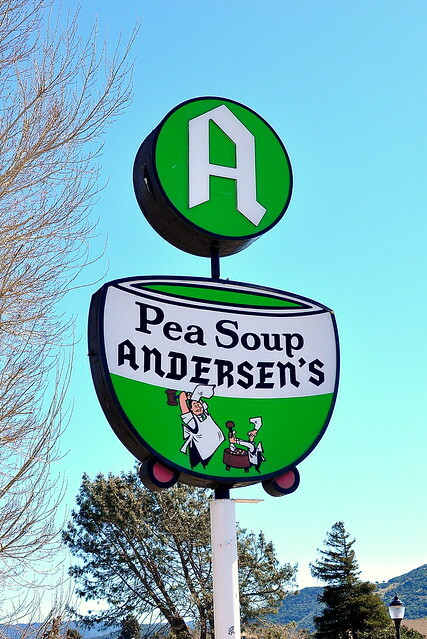 I have always wondered about Pea Soup Andersen’s every time I have passed it on various road trips. Now I have an idea about what its like inside, as well as the allure of their famous dish. Thanks! My family makes sure to stop at Splitpea Andersons (or pea soup andersons for everyone else) every time we drive to So California. The place just feels magical. My husband and I have loved Split Pea Andersen’s Restaurant (and their soup!) for more than 30 years, and we often make the soup at home, using the “secret recipe.” (Don’t be fooled…the stuff in cans is NOT the same!) 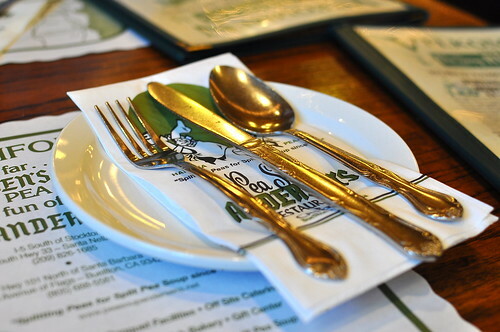 Andersen’s offers good food at reasonable prices. That’s hard for a traveler to find these days in a real sit-down-and-be-served restaurant. Don’t knock it till you try it!